3. Here’s how to get the most from the hour. 5. Tell us about your day on Twitter hour using our MNC emojis – click here to download. Tag the organiser early on. It’s good manners to greet the organiser or moderator of the chat. Usually local hours e.g. 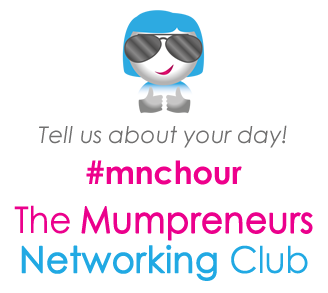 #MNCHour is run by @mumpreneursclub so include the latter in your introduction or greeting tweet. Use the hashtag #mnchour in every message. The tags allow people to follow the conversation but also some organisers gather tweets at the end using publishing platforms such as Storify. Follow those who taking part. Try and follow everyone unless they are largely irrelevant to your networking. It’s good manners and forms good connections for future networking with Twitter. Try not to be too salesy. By all means be clear about your business and what you offer but don’t lay it on too thick. One or two tweets promoting yourself then spending time chatting. If the conversation naturally revolves around your expertise then obviously run with it. Prepare a few images or 30 second vids to share. Multimedia flies on Twitter, so have a few to hand ready for your networking. It increases the impact of your message long after the hour has ended. Be transparent about Twitter chat clashes. There’s nothing wrong in two-timing your chat hours but perhaps declare at the start, so people know if there’s a delay to a question they’ve directly asked you. Have fun! As well the opportunity to network, learn something new, crack a few light jokes and be positive. And it should go without saying to be respectful and don’t swear. If you’re not sure about how a message you’re writing will be received, then don’t post. Do you have any other tips for people taking part in a Twitter chat hour? Let us know, we’d love to hear your thoughts.